Amy & Niamh (4) help Anne Shaw of Fyne Futures with the curb-side collection for the launch of Zero Waste Bute, Scotland’s second Zero Waste Town (and the world’s first Zero Waste Island). Are you championing Zero Waste and have some innovative ideas burning to get implemented? Then perhaps you could follow Zero Waste Dunbar and Zero Waste Bute and become Scotland third Zero Waste town. Zero Waste Scotland are encouraging environmental projects promoting a circular economy approach to apply, and especially urban projects are urged to come forward this time round. 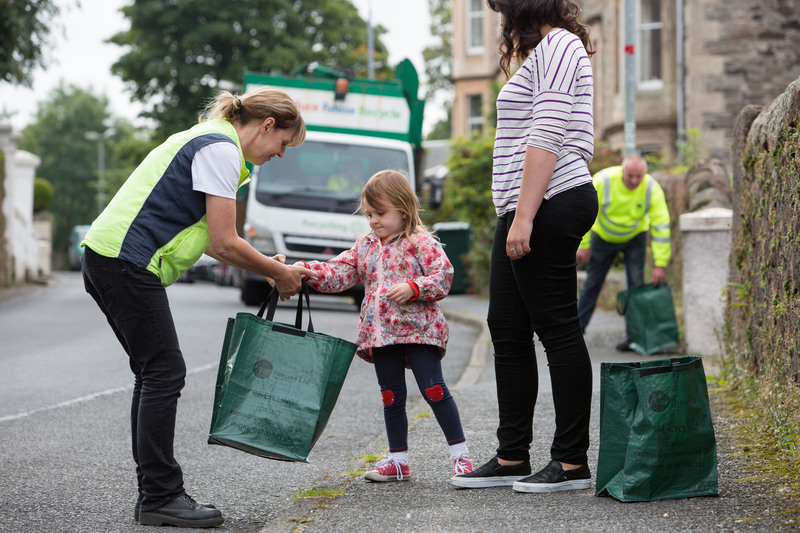 Applicants will be expected to provide details of innovative approaches they would take to help their communities to achieve ambitious Scottish Government national targets, including a 70% household recycling rate and a 33% reduction in wasted food by 2025. Measures to increase re-use, repair and resource efficiency should also form part of the bids. The town that’s chosen will receive funding from Zero Waste Scotland’s Resource Efficient Circular Economy Accelerator Programme to help it implement its ideas. Zero Waste Scotland works to ”create a society where resources are valued and nothing is wasted”. They are funded by the Scottish Government and the European Regional Development Fund to support delivery of the Scottish Government’s circular economy strategy and the EU’s Europe 2020 growth strategy. LINKS Recently they have been busy promoting the climate case for a circular economy, supporting the carrier bag charge, contributing to the Government’s Litter-Free Scotland Strategy, and engaging people in food waste recycling. Read more about them here.